In the fourth and championship game of the 2009 NB Peterbilt Pete Kelly Cup it was the host University of New Brunswick Varsity Reds winning 4-1 over the Université de Moncton Aigles Bleus. When any team from Fredericton plays their provincial rival from Moncton there is usually lots of passion and intensity, and Wednesday's game was no exception, with a paid attendance of 2449 braving a blustery cold night to make their way to the Aitken University Centre for an entertaining match-up. Pierre-Alexandre Marion (Gatineau, QC) at one end of the ice, UdeM's Francis Rochon (Gatineau, QC) had half a step on the UNB defence on the rush going the other way and he beat Travis Fullerton (Riverview, NB) with a shot along the ice. UNB had their chances in the first period, but the UdeM players did a good job of sticking with the Varsity Reds, and clogging up the skating lanes. Just over 13 minutes in, UdeM was outshooting UNB 7-3, but the V-Reds started to break through and the shots were 10-7 in favour of UNB by the end of the period. managed to kill off the penalty, and then were promptly handed a delay of game penalty after getting back to full strength for a line change deemed foul by the referee. Near the end of that power play UdeM captain Pierre-André Bureau (St-Prosper, QC) was called for checking behind on UNB captain Kyle Bailey (Ponoka, AB) and given the automatic game misconduct. At 16:08 Jeff Lee (Calgary, AB) made it 3-1 for the V-Reds as he went five-hole on Marion after UNB defenceman Ben Shutron (Orleans, ON) wreaked havoc down low on the play. The shots favoured UNB 11-9 in the second period. Derek Yeomans (St. Albert, AB) spelled off Fullerton in nets to start the third period. UNB was in another 5-on-3 shorthanded position midway through the period, but they managed to kill this one off successfully as well. However, they had their own 43 second 5-on-3 power play two minutes later and didn't cash in. Events got dramatic, and emotions boiled over, at 15:45 when UNB's Chris Culligan (Howie Center, NS) crashed the Moncton net for a goal with many Aigles Bleus taking exception to the play, particularly Jean-Phillippe Paquet (St-Georges de Beauce, QC) who earned a five minute major for cross-checking. In the resulting scrum UdeM's Rémi Gautreau (Moncton, NB) rabbit-punched UNB star forward Hunter Tremblay several times before Tremblay lost his patience, and his gloves, and proceeded to hammer Gautreau to the ice. Both players were handed fighting majors and ejected from the game. After it all settled, UNB finished the game on the power play, but they didn't show a lot with the man advantage and were unable to increase their lead. UNB outshot UdeM 11-4 in the third period and 32-20 in the game. The Summit Dodge players of the game awards went to Moncton goaltender P-A Marion and UNB defenceman Ben Shutron. Before UNB captain Kyle Bailey was handed the Pete Kelly Cup, the Peterbilt NB Pete Kelly Cup McDonald's tournament All Star team was named: forwards Hunter Tremblay and Daine Todd from UNB along with Dean Ouellet from UdeM; defenceman Ben Shutron from UNB and Jules Melanson from UdeM and UNB goaltender Travis Fullerton. The Alexander Keith's tournament MVP was UNB rookie Ben Shutron. UNB won the Pete Kelly Cup by defeating the UdeM Aigles Bleus by a score of 4-1 in the championship game of the tournament. Scoring for the V-Reds were Harty, Tremblay, Lee, and Culligan. Francis Rochon scored the UdeM goal. Travis Fullerton got the start, and Derek Yeomans took over for the 3rd period. As is usually the case, the game between UdeM and the V-Reds got a little chippy. After the last goal, tempers flared and the teams locked up. Off to one side, Remi Gautreau threw several jabs at Hunter Tremblay, seemingly as an invitation to go. He finally accepted and landed a few shots that knocked Gautreau to the ice. No word yet on the possible suspension but, well worthwhile if it happens. Bruce Hallihan provides the Daily Gleaner game story. the hometown St. Thomas Tommies defeated the University of Toronto Varsity Blues 3-2.
spirited match by both teams coming off losses the day before. to Mike Reich (Craik, SK) at the side of the post who banged it in for the goal. the ice on the rush and beat MacFarlane low on the short side with a quick release. were Matt Eagles for the Tommies and Andrew Kizito for the Varsity Blues. On Friday, December 29, 2009, in the first game of the 2009 Peterbilt Pete Kelly Cup the Université de Moncton Aigles Bleus defeated their provincial rivals St. Thomas Tommies 4-3. Both squads started the game with lineups depleted due to injuries before a small afternoon crowd of about 150 at the Lady Beaverbrook Rink. Moncton opened the scoring at 11:47 of the first period when defenceman Jules Melanson (Memramcook, NB) stepped into a puck in the high slot and blew it by STU netminder Guillaume Miszczak (Montréal, QC). Moncton extended their lead at 16:59, seconds after their power play expired, when Francis Rochon (Gatineau, QC) tipped a Jean-Phillippe Paquet (St-Georges de Beauce, QC) shot past the STU goalie. With ten seconds to go, Remi Gautreau (Moncton, NB) checked STU captain Erick Tremblay (Gatineau, QC) from behind into the boards, and in the resulting melee he added high stick and roughing minors to go with the game misconduct for the check from behind. He did manage to take two Tommies with him to the penalty box, just giving STU a two minute power play. At 6:44 of the second period STU was on a 5-on-3 power play when Tremblay blasted the puck past Kevin Lachance (Vanier, QC). Midway through the period Patrick Lockyer (Moncton, NB) almost restored Moncton's two goal lead, but his puck clanged off the crossbar. Tremblay tied the game for the Tommies late in the second period at 18:47 after a faceoff win when his point shot went through a screen in front of the UdeM goaltender. In the third period STU took the lead for the first time at 3:22 when Jason Cassidy (Toronto, ON) banged a rebound past Lachance. Moncton was back on the power play, thanks to a Tyler Dietrich (Vancouver, BC) double-minor retaliation penalty, when Mathieu Labrie's (St-Quentin, NB) point shot deflected of Dean Ouellet (Edmundston, NB) and in at 6:47 to tie the game once again. Then at 12:54 Ouellet made an outstanding play in the neutral zone, took the puck into the STU zone and passed the puck onto fellow Madawaskan Alexandre Soucy (Baker Brook, NB) who snapped the puck into the net. Soucey, normally a defenceman, played forward all game. The final score was 4-3 for Moncton and UdeM outshot STU 31-21 in the game. The Summit Dodge players of the game were Erick Trembley for STU and Alexandre Soucey for Moncton. UdeM will meet UNB in the tournament championship game. bus, and take care of ticket arrangements in Maine. If you have any further questions please do not hesitate to email me. visible as possible in the crowd. And don't forget to bring your passports!!! Pete Kelly Tournament Final: UdeM@UNB 7pm tonight! The Universite de Moncton Aigles Bleus got passed the STU Tommies yesterday with a score of 4-3 to earn the right to play in today's final. Dean Ouellet was the hero for the Aigles Bleus as he tipped in a shot at 6:47 of the third period to give them the win. The story at the AUC was a different one, as the V-Reds dominated the play for the majority of the game and skated to a 5-1 win which could have been much more lopsided if not for some spectacular saves by Russ Brownell, UofT's goalie. Daine Todd led the V-Reds attack as he registered two goals and two assists. The V-Reds outshot the Blues 45-12 in the game. The consolation final between the STU Tommies and the UofT Varsity Blues will take place today at 3pm at the AUC. Daine Todd had 2 goals and 2 assists to help UNB to a 5-1 win over the University of Toronto Varsity Blues. Also scoring for UNB were Taylor Procyshen, John Scott Dickson, and Josh Kidd. Travis Fullerton started the game, and Derek Yeomans took over around the half way mark. Sean Fontyn beat Yeomans with a quick shot to score the only UofT goal. UNB will play UdeM in the championship game of the Pete Kelly Cup tournament this evening at 7 P.M. UdeM squeaked by STU in the other Pete Kelly Cup game earlier in the day, so STU will play UofT at 3 P.M., also at the Aitken Centre. Bruce Hallihan has the game story in today's Daily Gleaner, and informs us that Ben Wright is expected to arrive in town Friday, while Jon Harty (who played a period last night) is close to returning from surgery. Game two of the Pete Kelly tournament sees the University of Toronto Varsity Blues (6-7-3) visiting the V-Reds (15-0-0) at the AUC at 7:30pm on Tuesday night. The V-Reds are 0-4-0 in the previous meetings of these clubs, but have not played against the Varsity Blues since October of 1985. The Varsity Blues, although not off to a great season thus far, have pushed the #6 UQTR Partiotes to overtime twice this year, and beat the #5 McGill Redmen 4-3 in their last OUA regular season game of the first half. 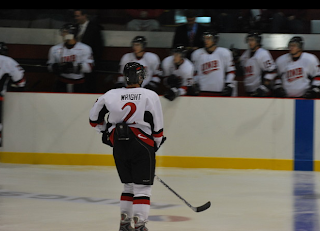 The Varsity Blues are led by second-year forward Byron McDonald with 8 goals and 14 assists in 16 games. Andrew Martin, Toronto's goalie, is second in the OUA goaltenders with a .924 saver percentage. It is with great sadness that we share the news of the passing of Terry Shannon, a long-time V-Reds hockey fan. Many of you would know him from the Aitken Centre where he and his wife ran the concessions up until a few years ago. We express our deepest sympathies to the family of Mr. Shannon. Here's a look at how the scoring distribution breaks down by period over the last 4 seasons. There's lots of hockey left to play, but so far things are looking good. Let us know what areas you think the team needs to improve at? Be sure to check out David Kilfoil's mid-season AUS report card over at the CIS Blog. A few scores might generate some controversy, but it's hard to argue with the relative rankings. As is typical in the AUS, a few more weeks of action would probably change things a bit. The news gets better for Dion Campbell. Yesterday he was announced this week's winner for AUS Subway Male Athlete of the Week to go along with the school award he won earlier. The last CIS Top 10 of 2009 was released today. Not much change at the top as UNB, Alberta, Western and Acadia hold top 4 spots respectively. McGill managed to leapfrog UQTR after UQTR was upset by Carleton. SMU (win vs. StFX, loss vs. UNB) and Laurier move up after Lakehead dropped a pair of exhibtion games to unranked Saskatchewan. SMU appears to have won the tie-breaker and holds #8 going into the break. x- SMU was awarded 8th (over Laurier) based on number of higher-placed votes. Other teams receiving votes: Saskatchewan (19), Waterloo (2). Here's the official CIS press release. Coming off a 2 goal performance vs. UPEI, and a huge assists against SMU, Dion Campbell has been named the UNB/Valley Graphics Male Athlete of the Week. (Daily Gleaner). Campbell's having a strong second season with the V-Reds. In 12 games so far, he has 4 goals and 3 assists for 7 pts. He's already passed his rookie year totals of 3 goals and 3 assists (6 points) in 19 games. 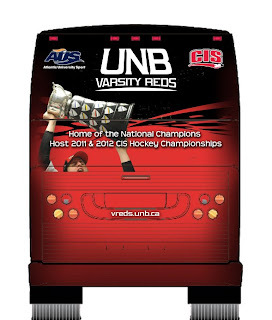 FREDERICTON - The UNB Varsity Reds will be travelling in style in 2010, thanks to travel partner Can-Am Charters and corporate partners Sodexho, Pepsi and UNB U First: Recruitment and Retention. "We are excited about the opportunity to showcase one of the top programs in the country on our bus. We have provided transportation for the Varsity Reds for a number of years and look forward to continuing our partnership with them into the future," commented Mark Hurley, owner, Can-Am Charters. The new bus will be a rolling showcase for the University of New Brunswick, building awareness across the country as the travelling billboard moves throughout the Maritimes and beyond. "Such a sensational promotional tool will have a very positive effect on our student recruitment efforts," says Susan Mesheau, Executive Director of U First: Recruitment & Retention. "Our partnership with athletics has always been beneficial in attracting new students to our campus; this element adds a level of excitement that will generate a lot of notice to heighten UNB's top-of-mind awareness and reputation." The new 56 passenger bus is the latest in sustainable bus transportation technology, featuring innovations in fuel efficiency and weight reduction, and is the best possible environmental choice that is available at this time. It is equipped with reclining seats, TV screens, washrooms and air-conditioning and has ample storage. "Travel is a necessary expense for anyone fielding a team in the AUS, or anywhere else for that matter," says Kevin Dickie, Director of Athletics, "this joint venture allows us to maximize the effectiveness of our recruiting and advertising dollars while at the same time gets the most out of our transportation budget." An added bonus is the fact that it's available for charters. The Fredericton community is encouraged to rent the bus for group travel and showcase the University of New Brunswick at the same time. 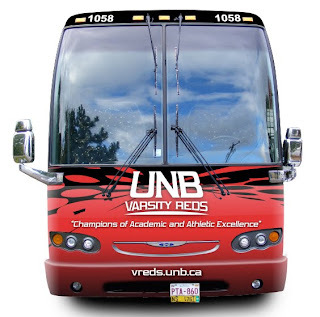 Learn more about the UNB bus by contacting Can-Am Charters at 1-866-217-0842 to check availability or receive an individualized quote. "Champions of Academic and Athletic Excellence"
FREDERICTON – It was the third game of the season between the UNB Varsity Reds and UPEI Panthers men's hockey teams, and the third time the V-Reds blanked the Panthers, with Derek Yeomans (St. Albert, AB) picking up the 7-0 shutout this time, his first of the season. The victory runs UNB's winning streak to 14 straight games since the start of the season. It was a special night at the Aitken University Centre, as almost all the members of the 1983-84 AUAA (now AUS) champion UNB Red Devils (as the team was known then) were in attendance after travelling from across North America for their 25th reunion. Each of those players and coaches were introduced on ice to the 2300 fans before the opening faceoff. The new generation of UNB players didn't take long to show what they could do, as Hunter Tremblay (Timmins, ON) scored his 14th goal of the season as he banked a backhand past UPEI goalie Wayne Savage (St. Thomas, ON) at 2:48. Less than two minutes later Dion Campbell (Melville, SK) came flying down the left side and he beat Savage on the short side with a backhand that Savage probably would have like to re-play. Just before the six minute mark at the other end of the ice UPEI's Brandon Biggers (Sarnia, ON) beat UNB's Yeomans, but his shot rang off the crossbar, and that was as close at the Panthers were going to come all game. At 16:21 UNB was on the power play and Tremblay didn't get good wood on a rebound but rookie Chris Culligan (Howie Center, NS) came in from the circle and buried the puck to put the home team up 3-0. That was all the scoring in the period that saw UNB outshoot UPEI 15-5. The second period didn't go much better for UPEI. Campbell was having another great shift near the four minute mark when he came from behind the UPEI net, and both Campbell and Jeff Lee (Calgary, AB) got whacks at the puck, which appeared ultimately to bounce off a Panthers defender and inside the far post past Savage. Campbell eventually got credit for the goal. UNB was on the power play again at 7:17, and on the rush, when Campbell feathered a pass to Jordan Clendenning (Fredericton, NB) who crashed the net for an “old school” goal. After the goal Jhase Sniderman (Toronto, ON) took over in the UPEI nets. Shots favoured UNB 12-9 in the middle period. UNB appeared to have a little less intensity in the third period, but after UPEI killled off a penalty UNB was still in the zone and controlling the puck when John Scott Dickson (Barrie, ON) beat Sniderman for his 11th goal of the season at 8:48. Late in the period at 17:23 UNB was on the power play yet again, and this time Clendenning was at the back door when he took the pass from Luke Lynes (Rochester Hills, MI), bent his knee, and went top shelf. With 90 seconds to go and play a little sloppy Matt Carter (Mississauga, ON) had the best chance to spoil the shootout, but he was stoned by Yeomans. Final shots in the game favoured UNB 36-20. The V-Reds were 3-for-8 on the power play while the Panthers were 0-for-4. The player of the game was UNB's Dion Campbell. Immediately after the game in the Coulter Room there was a special ceremony where each of the players and coaches from the 1983-84 team introduced themselves in turn, followed by UNB coach Gardiner MacDougall introducing each of his current players and coaches to the previous generation. After all of the talks and speeches the 1983-84 team made the surprise announcement that they were funding a new annual UNB hockey team award (scholarship) and trophy in honour of their coach, Don MacAdam. MacAdam admitted that he was surprised and humbled by their gesture. Next up for the V-Reds is a 5:00 pm game on Sunday against Saint Mary's, their last game of the first half. The V-Reds will host the UPEI Panthers in their third match of the season this evening at the AUC. UPEI played a strong game a few weekends ago, holding UNB to only 2 goals. Fortunately for UNB, the Panthers couldn't find the back of the net, but they have been playing better recently under new Coach MacPherson. Prior to the game, the V-Reds will pay tribute to the 83-84 UNB Red Devils hockey team who are in town for the 25th anniversary of a very special season. Bill Hunt talks a bit more about them in today's Daily Gleaner. Game time is 7PM. If you can't make it to the AUC, you can follow the game on Rogers TV or UNBHockey on Twitter. Also, anyone care to guess how much weight conditioning coach Ken Seaman has caused Luke Gallant to shed since last season? "I consider that team the blueprint." The latest installment of the Men's Hockey Top 10 Rankings has been released. No change ine the top 3 with UNB (13-0-0), Alberta (14-1-1), and Western (13-2-0) holding on to #1, #2, and #3 respectively. The biggest mover this week was Acadia (11-3-0) who has climbed from #7 to #4 after a big overtime win over #9 SMU (8-3-2). Also receiving votes: Saskatchewan (12), St. Francis Xavier (3), Calgary (1), and Waterloo (1). MONCTON – The University of New Brunswick Varsity Reds stretched their unbeaten streak to 12 games, but they twice had to come from behind before finally defeating the Université de Moncton Aigles Bleus 7-5. UNB outshot UdeM 40-27 in the game, but the physical Moncton team was very opportunistic with their goal scoring, making the most of their opportunities. The first good scoring chance in the first period came around the 6:45 mark when UdeM's Mathieu Bétournay (Saint-Chrysostome, QC) stripped the puck off UNB defenceman Luke Gallant (Bedford, NS) at the Moncton blue line and had a breakaway the other way, but was ultimately unsuccessful in trying to deke Travis Fullerton (Riverview, NB) in the UNB net. Just after Hunter Tremblay (Timmins, ON) almost scored, UNB captain Kyle Bailey (Ponoka, AB) did score off the faceoff on Kevin Lachance (QC) with his backhand at 8:31. On that play Jeff Lee (Calgary, AB) picked up his first point in his first game as a Varsity Red. Eight minutes later UNB's Daine Todd (Red Deer, AB) started to come out of the UNB corner with the puck, but his stick snapped in half and Guillaume Parenteau (Boucherville, QC) jumped on the loose puck and got it quickly over to Rémi Gautreau (Moncton, NB) in the slot who went top corner to tie the game. Just over a minute later Bétournay knocked the puck off a UNB stick and past a surprised Fullerton to take the lead for Moncton. Not two minutes later, at 19:45, the V-Reds turned the puck over in the neutral zone and les Aigles Bleus captain Pierre-André Bureau (Saint-Prosper, QC) carried the puck into the zone and let loose a quick shot that Bétournay deflected nicely into the top corner of the net for the 3-1 lead, despite being outshot 14-8 in the period. At 2:01 of the second period Bailey was in the slot when he took a pass from Lachlan MacIntosh (Perth-Andover, NB) and beat LaChance over the glove hand to cut Moncton's lead to one. Bailey was leading the rush at 7:00 as all three UNB forwards came up the left side and drew the Moncton defenders to them. Bailey fired the puck cross ice to defenceman Bretton Stamler (Edmonton, AB) who had an open lane to the net and he rifled a shot into the top corner to tie the game. However 54 seconds later Parenteau entered the UNB zone, drew the defenders and dished the puck to Charles Bergeron (St.Joseph-de-Coleraine, QC) who scored to give UdeM the lead once again. Midway through the period Bailey almost had a hat-trick to tie the game, but his shot rang off the far post and out. UNB had several minutes of sustained pressure and were finally rewarded when Matt Fillier (Durham, NS) scored at the end of a tic-tac-toe play at 12:15. That was the end of the scoring in the period where UNB edged UdeM 13-11 in shots. After the third time the Moncton net came off its moorings, UdeM goalternder Lachance was handed a delay of game penalty at 5:28. Late in the resultant power play John Scott Dickson (Barrie, ON) beat Lachance on the short side for the go-ahead goal. At 10:08 Hunter Tremblay made a great individual effort as he blocked a shot at the UNB blueline and then outraced and battled two Moncton defenders the length of the ice before beating Lachance glove-side. Moncton was on the power play at 13:42 when the puck bounced off UNB defender Stamler to UdeM's Bergeron who then passed to Bureau and in to bring Moncton within a goal once again. The rest of the period was pretty physical until Tremblay salted away the win as he led a two-on-one into the Moncton zone, turned his back to the goalie in the slot and fed the puck to Alex Aldred (St. Albert, AB) who had a yawning net to score on at 18:01. UNB outshot UdeM 13-8 in the final period. The final score was 7-5 for UNB, who outshot UdeM 40-27 in the game before 1072 fans at the J-Louis Levesque Arena on the UdeM campus. UNB was 1-for-5 with the man advantage while UdeM was 0-for-2. Next up for the Varsity Reds is a Saturday home date with cross-campus rivals St. Thomas.